29-Nov-2007 -- We visited this Confluence on Thursday, 29 November 2007 during our visit to Bīša city. We were on a trip to Najrān which is in `Asīr region. This Confluence is between Bīša and Tathlīth and it is on sandy stone land about 45 km from Bīša, it is the area inhabited by the great tribe of Qaḥṭān. 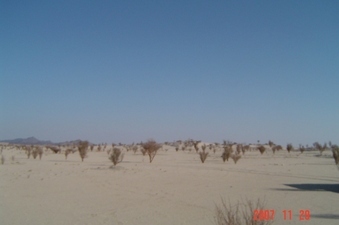 The area of the Confluence is surrounded by many Acacia trees and by granitic mountains. It is close to Haḍāb al-Naẓīm and the area where it is located is generally called al-Mīthab. This area is characterized by many granite and quartz mountains. An asphalt road will soon be constructed near this area between Bīša and Tathlīth over a length of 120 km. We visited this Confluence in the morning and had breakfast at it. #3: South view - al-Usbu`a mountain. #4: West view - Umm Hesha and Milha mountains. #7: al-Sa'ira mountain is the biggest of the quartz mountains on the Arabian peninsula and it is 20 km to the West of the Confluence.